Lower your ride height with the Tanabe Sustec NF210 Lowering Springs for your Lexus GS350 or GS350 F-Sport! 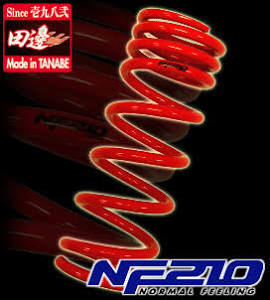 Unlike the GF210 model, which are aimed toward a performance minded driver, the NF210 series springs provide maximum drive comfort while giving your car less wheel gap and a better looking overall semi-aggressive stance. The Tanabe Sustec NF210 Lowering Springs have only a 5% increase in spring rates to ensure that comfort and drivability are the top priorities when taking your Lexus GS350 or GS350 F-Sport around town. These springs are manufactured to fit the stock shocks perfectly without compromising any of the other OEM stock suspension components. Each coil spring application is tested for fitment and optimal weight distribution for sportier handling.